The KeyboardEvent location property is used for returning a number that indicates the location of a key on the keyboard or device. 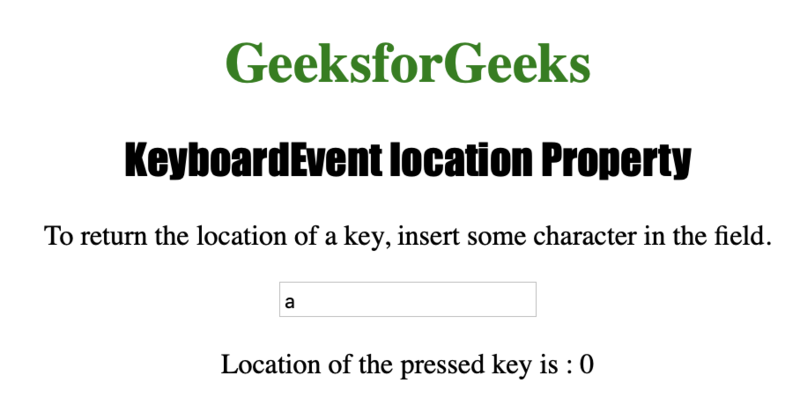 The KeyboardEvent location property can be used on the onkeydown and onkeyup events but not on onkeypress. 0 DOM_KEY_LOCATION_STANDARD This value represents almost every key on the keyboard, e.g. “B”, “R”, “SPACE” or “8”. 1 DOM_KEY_LOCATION_LEFT This value represents a left key, e.g. the left “CTRL” key or left “ALT” key. 2 DOM_KEY_LOCATION_RIGHT This value represents a right key, e.g. the right “CTRL” key or right “ALT” key. 3 DOM_KEY_LOCATION_NUMPAD This value represents a numeric key or a numpad key. Example-1: Getting the location of a key. // Return location of key.